We lost our finest tree this week. We didn't really lose it, of course. We knew exactly where it was. It stood in front of my study, shielding the room from the sun and providing a view of a tree and leaves and hyperactive squirrels. But it was tearing up the driveway and would soon have threatened the foundations of our house and the house next door, and it was showing the first signs of disease. So we hired some people to cut it down and cart it away. We didn't lose it, but it's a loss. I wanted to create a record of what it looked like and what it provided me, and what happened to it. We moved into our house in the autumn of 1971. The subdivision was then four years old. There were a few saplings here and there, but for the most part it was treeless suburbia. 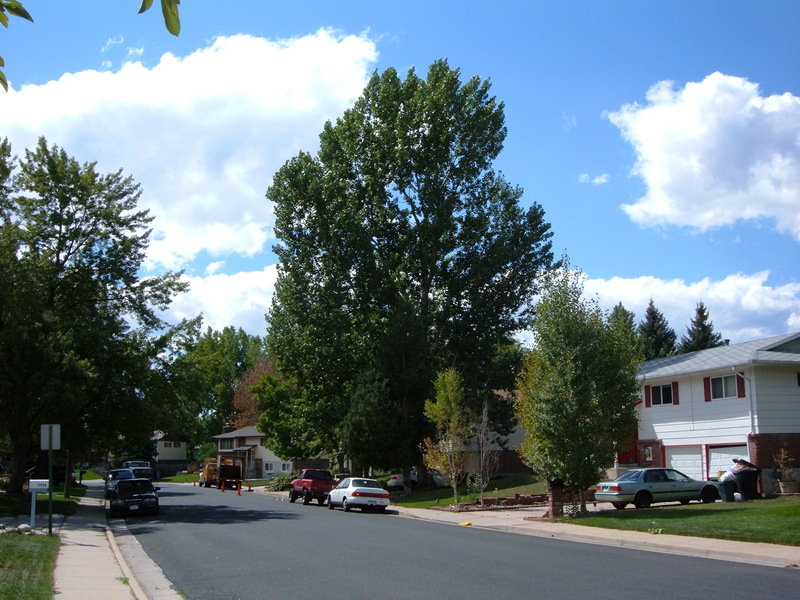 That is to say, it was sun-blasted suburbia, and in Colorado, "sun-blasted" has a meaning that people who live at lower altitudes might not fully appreciate. The previous owners of the house had planted some trees in odd places, including two blue spruce trees and a maple at the edge of the back yard and one blue spruce outside the dining-room window. After a few years, we started planting trees ourselves. 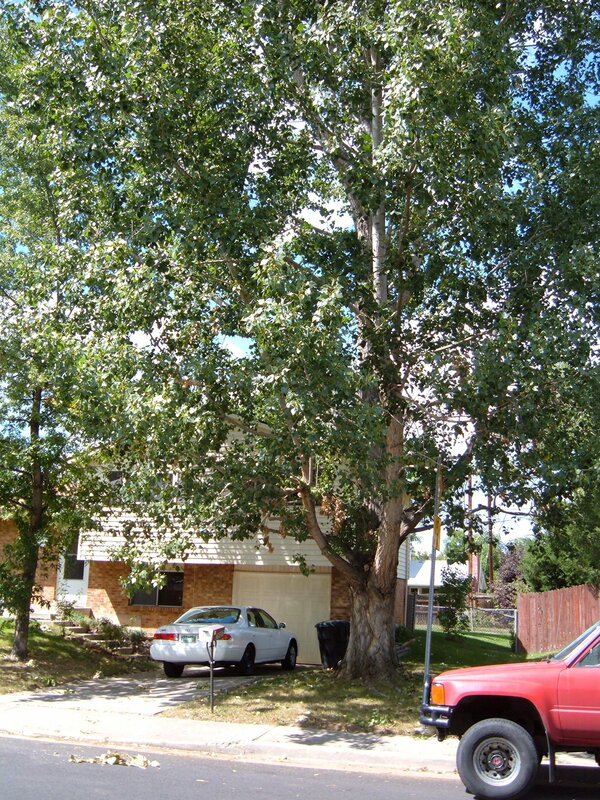 We started out with cottonwoods because we wanted shade quickly, and those are fast-growing trees. The people at the nursery advised against them. 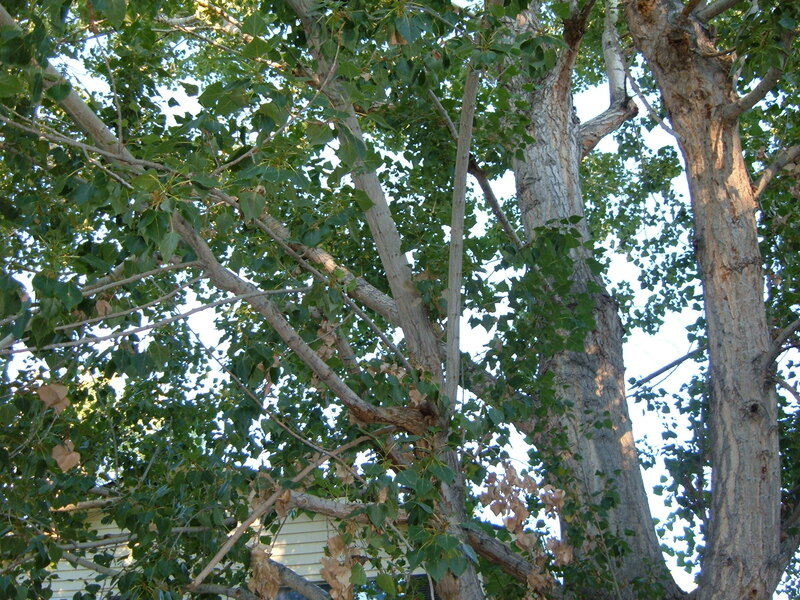 Cottonwoods do grow quickly, they said, but they're soft wood trees, so their branches are weak and prone to snapping off in storms or under the weight of snow. They're also prone to disease. You'll have to have them cut down eventually, they told us. We were sure we'd only be in the house for five or ten years. We'd have the benefit of the shade, and then we'd move out before the trees developed problems. 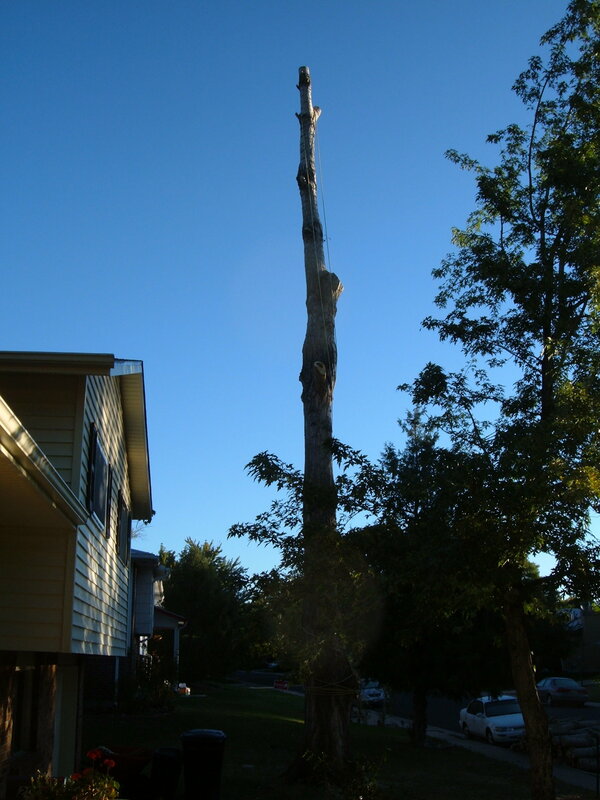 Decades passed, we stayed in the house, the trees grew, the predicted problems appeared, and one by one we had to have the cottonwoods removed. The maple planted by the previous owners became severely diseased and we had to have it cut down as well. The blue spruce outside the dining-room window grew extremely tall and blew over in a wind storm a few years ago, fortunately going down very neatly between our house and the neighbors' and not damaging either one. That tree held an affectionate memory for us. Our first dog, Carrot, a black lab and German shepherd mix, made that tree his territory. He dug a hole beside it and used to spend hours dozing there. Daniel, our son, called it "Carrot's tree," and after Carrot died, that tree was a reminder of Carrot happily sleeping in his hole beside his tree. That memory began to fade after the tree fell. 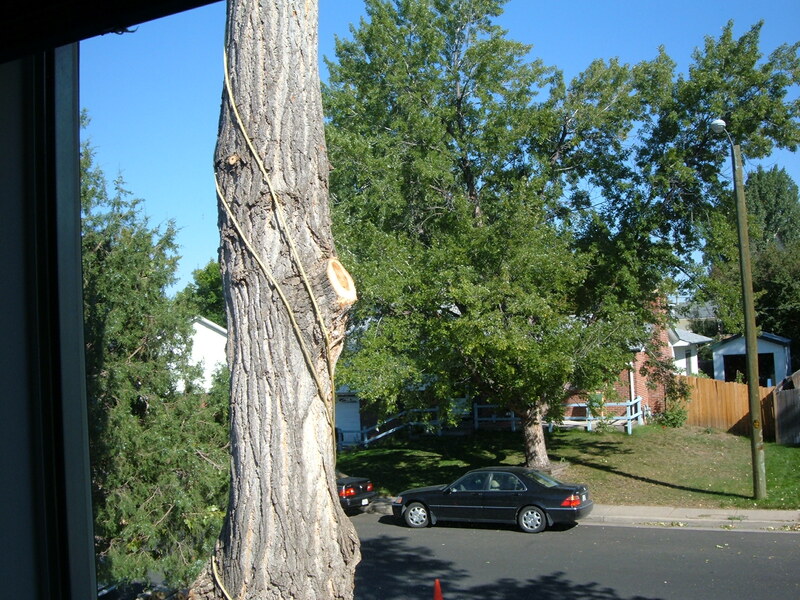 The big cottonwood outside my study outlived all those others. We liked to think that it had a special will to live. When it was about two years old, some time in the mid-1970s, and just a sapling, vandals cut it down during the night. 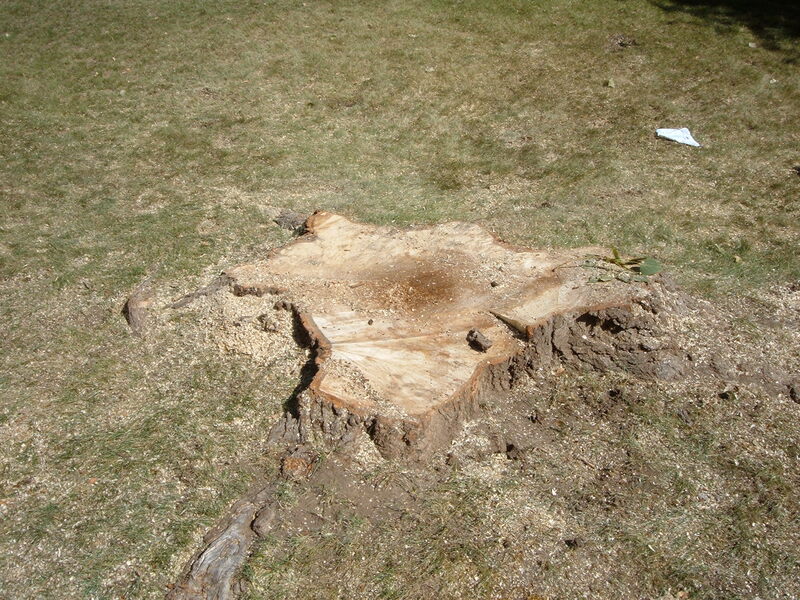 In the morning, we found a cleanly cut stump, with the trunk of the sapling lying next to it. At that time, what's now my study was Daniel's bedroom. He was seven or so at the time this happened. He had liked to look out his bedroom window at the top of the sapling, and he was both very upset that it had been cut down and astonished and outraged that anyone would do such a thing to a tree. People who live in lower, wetter locations probably aren't impressed by these pictures. 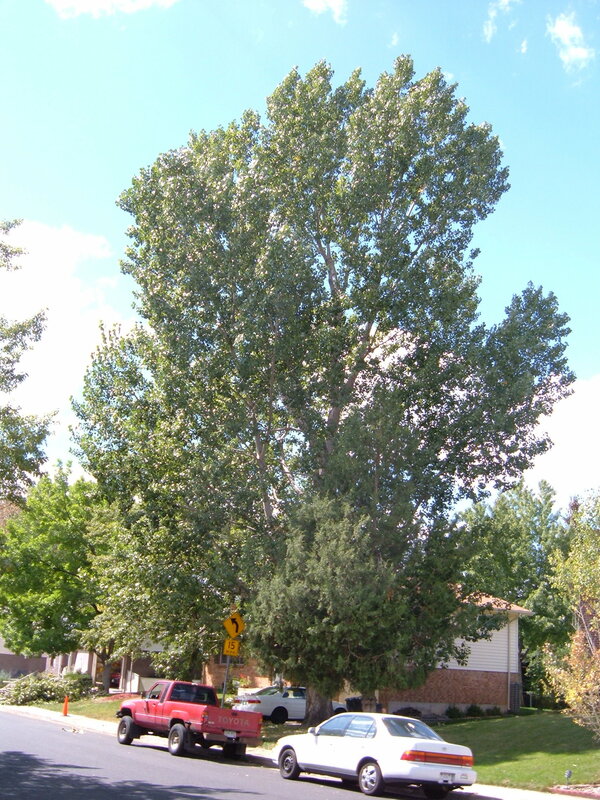 By Colorado standards, though, that's a remarkably big, dense, healthy cottonwood tree. 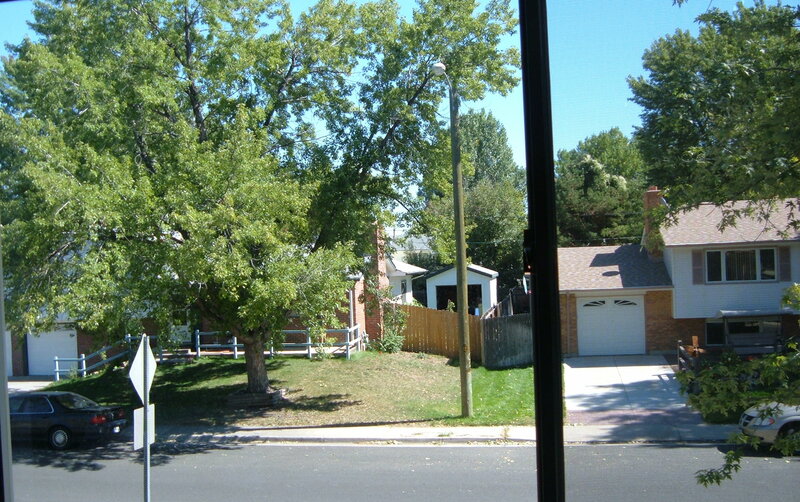 The next picture shows it in relation to the house. 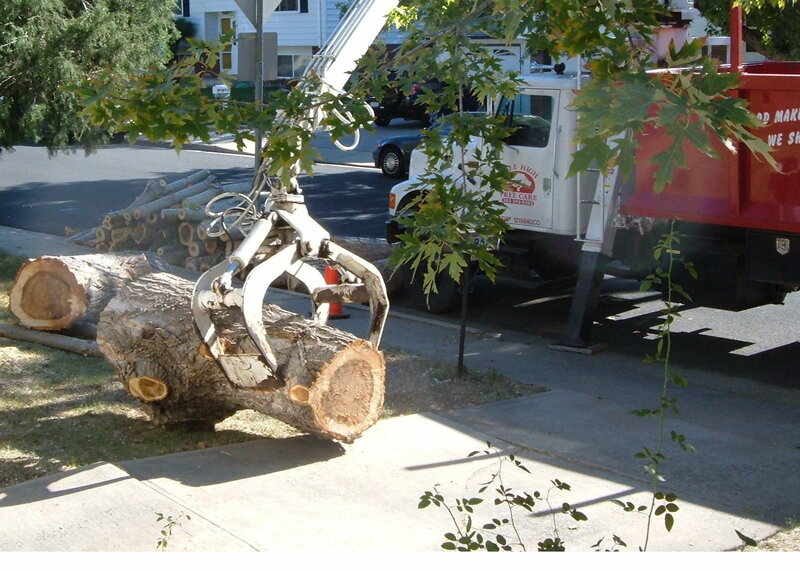 It also shows the beginning of trouble, the signs that the tree wasn't as healthy as it seemed from further away. The window just visible at the bottom of the picture, in the middle, is the main window of my study, Daniel's old bedroom. Squirrels loved that tree. Generations of them must have been born and spent their lives in it. I loved to watch them chasing each other all over the tree. In the above picture, you can make out a squirrel - mainly its tail - right in the center, sitting on a smallish horizontal branch. If you look carefully, beyond and a bit below that squirrel you can see what appears to be a mummified squirrel body draped over a branch. I hope he went to sleep peacefully in his lovely tree and just didn't wake up. I'm not one to anthropomorphize nature - not plants or land formations or animals - but I can understand the feelings that lead people to do so. A big, old tree has a kind of presence, an unmoving but living solidity, that makes you aware of it and makes you feel sadness and loss when it's gone. 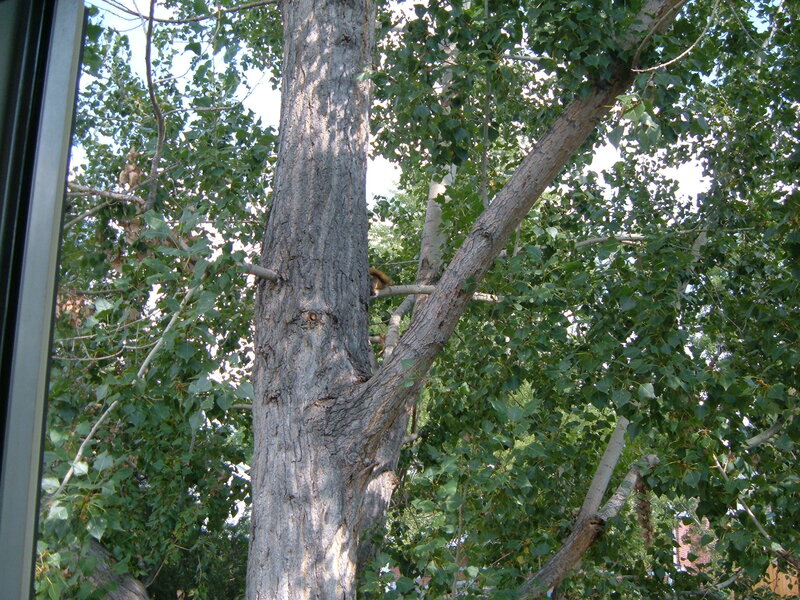 This big cottonwood wasn't just a home to squirrels, and it didn't just provide shade and a lovely view for my study. It was a quiet, sturdy, companionable presence out there, just beyond my desk. Not my friend, but my everpresent friendly neighbor. When we finally made the inevitable decision, we contracted with Mark Mortensen, a local arborist who had tended to our trees before. He showed up with his assistant and his assistant's hyperactive dog, Fancy. "She's my helper," the assistant said with a grin. 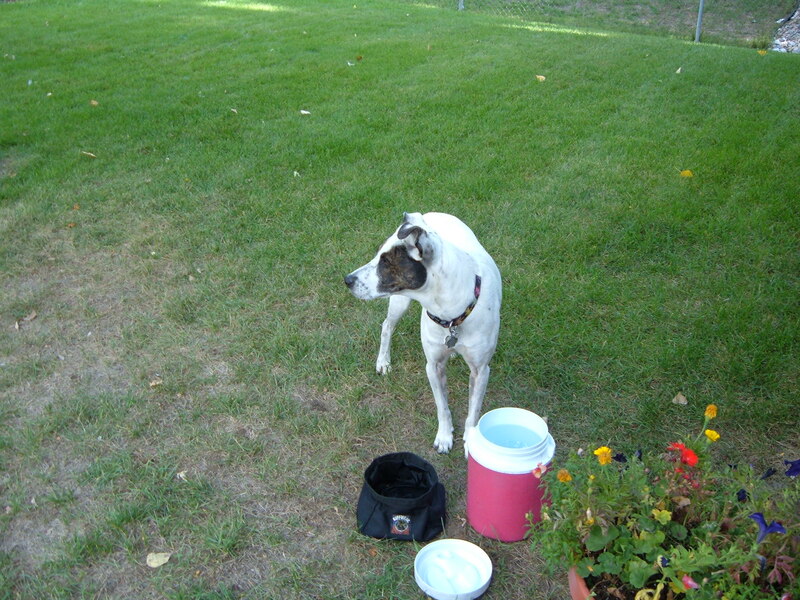 While the men unloaded their equipment and set up for work, Fancy checked out the back yard and the front yard and the neighboring yards and then apparently gave her go-ahead. It took all day just to cut off all the branches. The men left that evening, leaving draped around the trunk the ropes they had used while climbing the tree and lowering the branches. After the men and the dog had left, I saw a squirrel run across the lawn and start to climb the tree. He reached the first rope and stopped. He looked at the rope and up along the trunk. He went back and forth a few times, as though he were trying to decide whether to run up the trunk. At last he gave up and ran off to find another tree. The limbless, roped trunk was particularly disturbing. In spite of what I said above about not anthropomorphizing trees, that evening the cottonwood seemed like a living creature that had had its arms and legs cut off and was tied in place, waiting for the final blow. 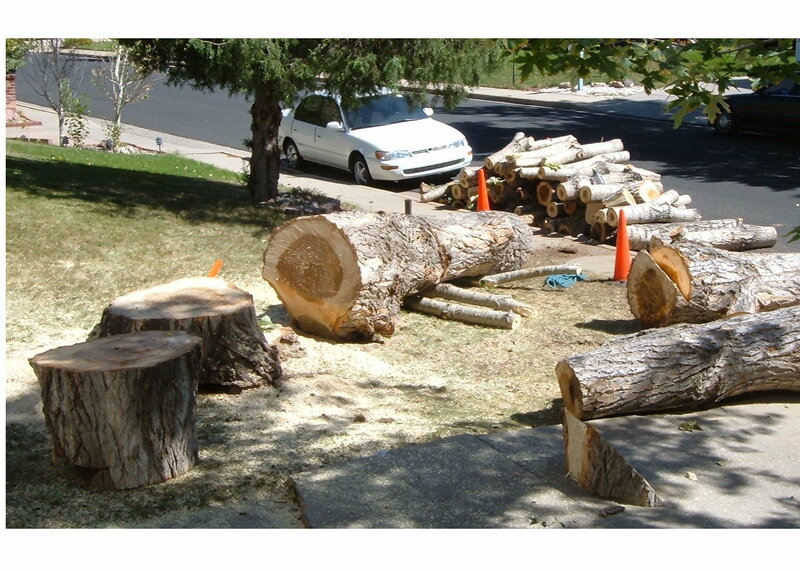 The next day, the trunk was reduced to logs. These were far too heavy to be lifted up and carted away by humans. Machines did that job. When all the logs were gone, the cottonwood was back to being just a stump. The next day, Mark returned to finish the work. After hours of grinding, there wasn't even a stump. 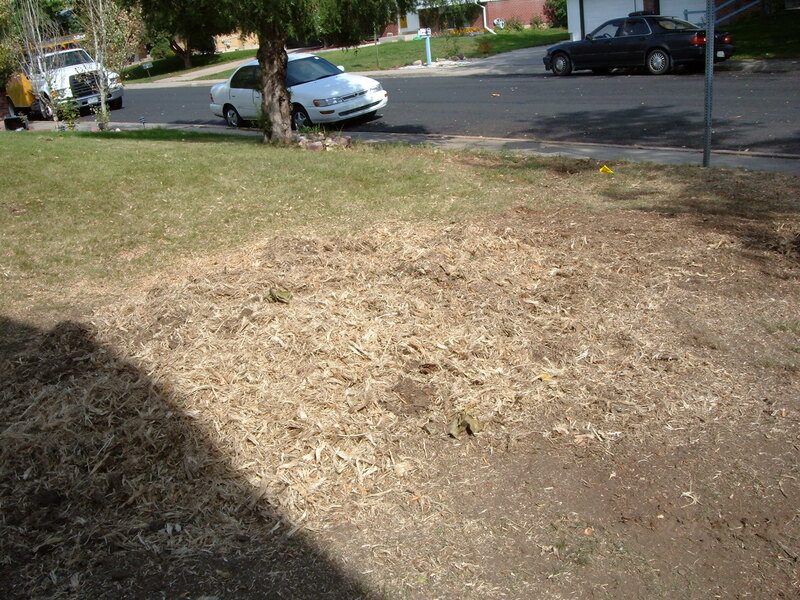 It was a just a pile of wood chips.